Multiple mechanisms are involved in the biogenesis of EVs: exosomes originate as intraluminal vesicles (ILVs) via inward budding of the limiting membrane of maturing endosomes, giving rise to multivesicular endosomes (MVEs) . MVEs are prone to fuse with lysosomes for degradation of their contents, however, they can also dock and fuse with the plasma membrane to release ILVs into the extracellular space . One of the best-characterized mechanism of exosome biogenesis involves the recruitment of the endosomal sorting complex required for transport (ESCRT) machinery to ubiquitinated proteins in the early endosome. There are four ESCRT complexes (ESCRT-0, −I, −II, and -III), which associate with ESCRT-associated accessory proteins, such as the ATPase VPS4, its cofactor VTA-1, TSG101, and Alix. ESCRT-0 complex recognizes and sequesters ubiquitinated proteins on the outside of the endosomal membrane. ESCRT-I and –II complexes are responsible for starting and driving intraluminal membrane budding. ESCRT-III complex performs vesicle scission to form MVEs . Trajkovic et al. have also described an ESCRT-independent exosome biogenesis pathway, which is mediated by the sphingolipid ceramide . Ceramide is produced from the hydrolysis of sphingomyelin by neutral sphingomyelinase 2 (nSMase2) . The cone-shaped structure of ceramide stimulates the negative membrane curvature to facilitate the membrane invagination of ILVs . The authors reported that nSMase2 is needed for the release of proteolipid protein (PLP) from Oli-neu cells . 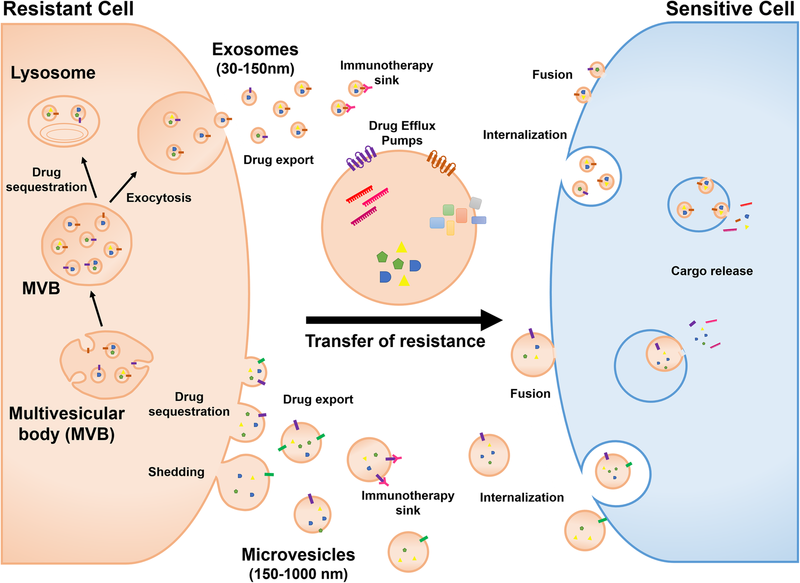 In addition, the ceramide-mediated exosome biogenesis pathway appears to be important for microRNA (miRNA) export via exosomes . Tetraspanin CD63 has also been shown to be involved in the sorting of melanocyte protein PMEL into exosomes in an ESCRT-independent mechanism . Some of the key regulators of MVE docking and fusion with the plasma membrane include several Rab family members (Rab11, Rab35, Rab27) as well as synaptotagmin-7 [13, 14, 15, 16, 17]. It was previously reported that cortactin and Rab27a coordinate to stabilize branched actin networks to allow MVE docking near the plasma membrane and exosome secretion at invadopodia . A critical biological feature that contributes significantly to cancer progression, invasion and metastasis is the ‘tumor microenvironment’ . 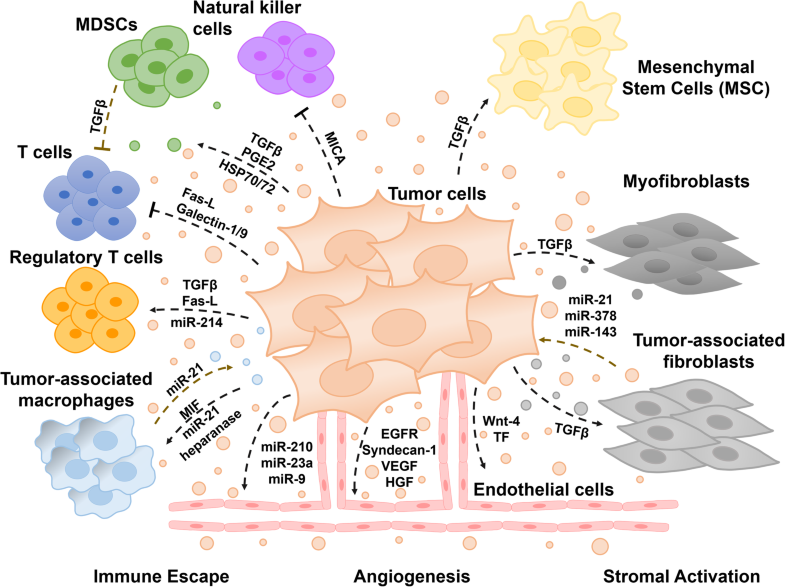 The tumor microenvironment (TME) is an interactive cellular environment surrounding the tumor whose main function is to establish cellular communication pathways supporting tumorigenesis . The cellular component of the TME mainly comprises immune and inflammatory cells, stromal fibroblasts, and endothelial cells forming the blood vessels that secrete a series of extracellular/angiogenesis signaling molecules, which in turn lead to a functional modulation of TME . The TME then converts into a pathological entity that continually evolves to aid cancer progression and invasion . 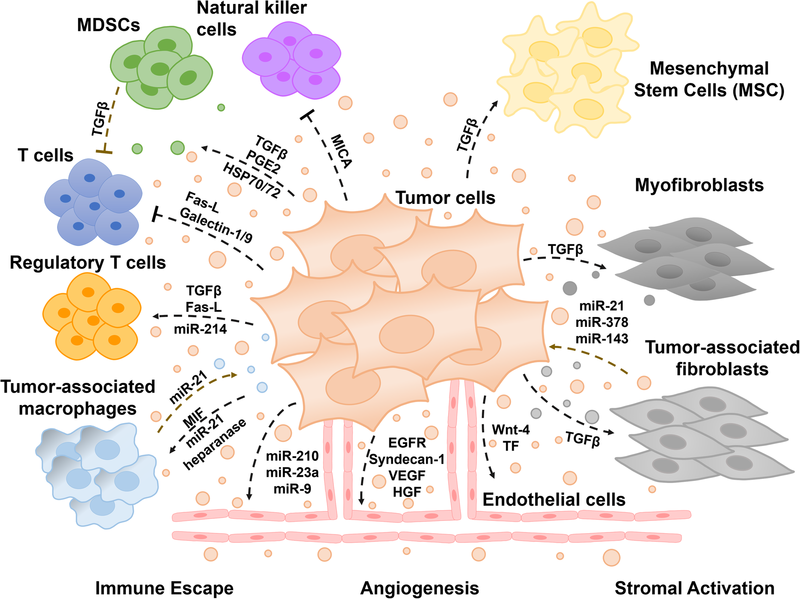 The extracellular vesicles (EVs) secreted by tumors, commonly known as tumor-derived EVs, have been well documented to modulate the tumor microenvironment (Fig. 1) . EVs are highly specialized entities of communication carrying several surface markers and signaling molecules, oncogenic proteins and nucleic acids that can be transferred horizontally to the stromal target cells and condition the tumor microenvironment for an improved tumor growth, invasion, and metastasis [26, 27, 28]. The role of EVs in cancer progression and metastasis is described in detail below. The tumor microenvironment is infiltrated by a variety of immune cells, such as lymphocytes (T cells, B cells, natural killer cells, and T regulatory cells), dendritic cells, monocytes, macrophages, myeloid-derived suppressor cells (MDSC), and granulocytes (neutrophils, basophils, eosinophils, and mast cells). The main role of these cells is to assure immune surveillance. However, tumor cells have been recognized to be capable of modulating signaling pathways within these immune cells and converting them into an immunosuppressive entity, thus leading to enhanced cancer cell survival and proliferation . Despite the fact that EVs contain tumor antigens capable of priming an anti-tumor immune response, accumulating evidence demonstrates that tumor cells utilize EVs in order to suppress the anti-tumor response through the secretion of bioactive immunosuppressive molecules. Actually, EVs have been shown to be critical mediators of the immune-cancer cell communication. One example of how tumor-derived EVs aid in evading immune surveillance is by inducing apoptosis in immune cells. Indeed, several tumor-derived EVs have been shown to be enriched for Fas ligand (Fas-L) which induces cell apoptosis when binding to its receptor. Wieckowski et al. described that Fas-L-positive tumor-derived EVs induce immune suppression by promoting the expansion of T regulatory cells and the apoptosis of anti-tumor CD8(+) effector T cells, thus contributing to immune escape . Similarly, this immune suppression mechanism through the release of Fas-L-containing EVs capable of inducing T-cell apoptosis was also reported in several cancer models, such as head and neck squamous cell carcinoma, melanoma, prostate, and colorectal cancer [53, 54, 55, 56]. The presence of other mediators of T- cell apoptosis in tumor-derived EVs has been reported for galectin-1 and -9, both causing T-cell apoptosis and immune suppression [57, 58]. Similarly, EVs released from mesothelioma, acute myeloid leukemia, or colorectal cancer have been shown to contain the transforming growth factor (TGF-β) on their surface and to deliver it to T-cells, inhibiting their proliferation in response to interleukin-2 and changing their phenotype to regulatory T cells [59, 60, 61]. Moreover, tumor-released EVs have been shown to impair monocyte differentiation into dendritic cells and to promote the generation of a TGF-β secreting myeloid immunosuppressive cell subset (MDSC), which inhibit T lymphocyte proliferation . The enrichment of prostaglandin E2 (PGE2) and TGF-β in tumor-derived EVs induces the accumulation of MDSCs with immune suppressive properties . Similarly, it has been shown that tumor-derived EV-associated Hsp72 or Hsp70 mediate the suppressive activity of the MDSCs via STAT3 activation [64, 65]. The presence of HSP72 and HSP105 in EVs has also been reported in melanoma, lung, and breast cancer cell lines, as well as in the serum of breast cancer patients. These EVs have been shown to activate dendritic cells and induce secretion of interleukin-6, which promotes tumor invasion by increasing MMP-9 metalloproteinase expression . Tumor cells can also release EVs containing MHC class 1 related chain ligand A (MICA) that is capable of binding to the NK cells receptor, NKG2D, leading to its downregulation and resulting in a marked reduction in NK cytotoxicity independent of NKG2D ligand expression by the target cell . Tumor-released miRNAs have also been involved in immune suppression. For instance, miR-214 secreted into EVs from Lewis Lung carcinoma cells was sufficiently delivered into recipient T cells and in vivo studies indicated that miR-214 mediates regulatory T cell expansion resulting in enhanced immune suppression and tumor growth in mice . Metastasis is a multistep process leading to the dissemination of primary tumor cells to distant organs. Tumor-derived EVs have almost been involved in all steps of tumor invasion and metastasis [15, 69, 70, 71]. Studies have reported that tumor-associated EVs play a significant role in invasion and metastasis through invadopodia formation [18, 72]. Invadopodia are dynamic actin-rich membrane protrusions that tumor cells produce to degrade and invade through the extracellular matrix . It was recently proposed that invadopodia are docking sites for EVs facilitating the degradation of the extracellular matrix through a localized secretion of metalloproteinase MT-1-MMP, thus promoting cell invasion [15, 73]. Similarly, the migration of tumor cells through tissues and chemotactic gradients is also initiated by the formation and release of fibronectin-bound EVs at the leading edge of migrating cells. These fibronectin-bound EVs are proposed to promote adhesion assembly and stabilization allowing a directional and persistent tumor cell migration [74, 75]. Tumor-derived EVs are also known to influence the integrity of vascular barriers, which is frequently associated with metastatic dissemination. Proteomics analysis of tumor-associated EVs has shown that EVs release a number of proteins such as SERPINA1, SERPINF2, and MMP9, the up-regulation of which play a significant role in ECM remodeling, vascular leakiness, and invasiveness . Likewise, melanoma-derived EVs have been shown to induce pulmonary vascular leakiness , while EVs produced by glioblastoma cells containing high levels of VEGF-A induce endothelial cell permeability and angiogenesis in vitro . In addition, EVs derived from lung cancer or breast cancer cells were reported to carry miR-23a and miR-105 respectively, which both target tight junction protein ZO-1, thereby increasing vascular permeability and cancer transendothelial migration [79, 80]. An interesting feature of tumor-derived EVs is their ability to establish a pre-metastatic niche, a phenomenon where the primary tumor can promote its own metastasis by recruiting stromal cells to distant organs or by modulating gene expression of distant cells in order to establish a growth supportive environment. EVs derived from colorectal cancer cells enriched for miR-21 can be specifically targeted to liver tissue and induce liver macrophage polarization towards an interleukin-6 (IL-6)-secreting pro-inflammatory phenotype, therefore promoting an inflammatory pre-metastatic niche supportive of liver metastasis . Moreover, melanoma EVs were shown to home to lymph nodes and consequently enhance the migration of melanoma cells to sentinel lymph nodes. In addition, melanoma EVs were able to upregulate the expression of genes within the distal lymph node microenvironment related to tumor cell recruitment to sentinel nodes, extracellular matrix modifiers promoting trapping of melanoma cells, and vascular growth factors promoting melanoma growth, creating a pre-metastatic niche supportive of metastasis . Melanoma-derived EVs were further reported to educate bone marrow-derived cells towards a pro-vasculogenic and pro-metastatic phenotype through the receptor tyrosine kinase MET . More recently, the uptake of pancreatic ductal adenocarcinoma-derived EVs by Kupffer cells (liver macrophages) was reported to cause TGF-β secretion and upregulation of fibronectin production by hepatic stellate cells, leading to an enhanced recruitment of bone marrow-derived macrophages through macrophage migration inhibitory factor (MIF), whose association with EVs correlated with liver metastasis occurrence and disease progression . Interestingly, using different tumor models, Hoshino and colleagues reported that the metastatic organotropism and establishment of a pre-metastatic niche is mediated by EVs via the secretion of different sets of integrins (for e.g. integrin- α6β4, α6β1, or αvβ5) that favor the preferential fusion of tumor cells with resident cells at their predicted destination. The authors showed that tumor-derived EVs taken-up by organ-specific cells prepared the pre-metastatic niche and that distinct integrin patterns predicted the organotropism of tumor cells, integrins α6β4, and α6β1 being associated with lung metastasis, while integrin αvβ5 was found to be associated with liver metastasis . Reprogrammed glucose metabolism is a hallmark of cancer cells. Remarkably, cancer cells are also proficient in reprograming the glucose metabolism of stromal cells through the release of EVs carrying high levels of the miR-122 that target the glycolytic enzyme pyruvate kinase. This mechanism is proposed to facilitate metastasis by increasing nutrient availability in the pre-metastatic niche . In addition to drug export or sequestration, cancer cells can transmit resistance through horizontal transfer of EVs carrying drug efflux pumps. Drug efflux transporters of the multi-drug resistance (MDR)-ATP binding-cassette (ABC transporters) system have long been acknowledged as major contributors to multidrug resistance in tumor cells . 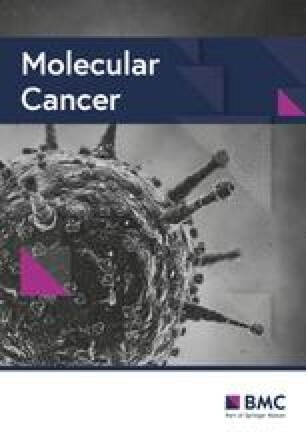 EVs carrying P-glycoprotein (P-gp, MDR-1 or ABCB1), one of the most well-studied drug efflux pump, have been implicated in the transfer of multidrug resistance to sensitive cells in several human cancer models, such as prostate and ovarian cancers, acute T lymphoblastic leukemia, and osteosarcoma [97, 98, 99, 100]. Indeed, EVs from sera of patients undergoing a course of docetaxel treatment compared to matched EVs from the same patients prior to commencing docetaxel treatment, when applied to both prostate cancer drug sensitive and resistant cells, showed a correlation between cellular response to docetaxel and patients’ response to treatment with docetaxel . Similarly, extracellular vesicles-mediated intercellular transfer of functional MRP1 drug efflux transporter (ABCC1) was reported in leukemia cells . Other drug efflux exporters such as ABCG2 or ABCA3 have been shown to transfer horizontally through EVs and modulate drug resistance in recipient cells [85, 102]. Although tumor cells represent an abundant source of EVs, it is important to question whether the consequences of this transfer of cargo is sustainable in vivo. The presence of selective P-gp/MDR-1 mRNA in EVs released from doxorubicin-resistant osteosarcoma cells suggests that resistant tumor cells use several means to spread drug resistance to sensitive cells, either by transferring MDR proteins directly to sensitive cells or by transferring the mRNA that encodes them, contributing to the diversity of drug resistance mechanisms . On the other hand, depletion of drug efflux pumps through EVs exocytosis has been shown to increase the sensitivity of tumor cells to anti-cancer drugs in vitro. In an in vivo setting, one can legitimately wonder whether this in vitro beneficial response could not result in a net drug resistance within the tumor microenvironment. Indeed, these EVs loaded with MDR transporters could be transferred to other cells within the heterogeneous tumor itself or the stromal cells within the tumor microenvironment, therefore possibly influencing their response to treatment. EVs transfer of cargo can contribute to the heterogeneity of tumor response to anti-cancer drugs. This cargo includes prosurvival factors, which enhance cell viability and decrease apoptosis sensitivity, thus leading to resistance to anti-cancer drugs. For instance, components associated with the PI3K/AKT pathway, one of the major oncogenic signaling axis involved in cancer cell proliferation and survival, have been reported in EVs. In hepatocellular carcinoma (HCC) invasive cells lines, resistance to Sorafenib in vitro as well as in vivo was induced by delivery of hepatocyte growth factor (HGF) through EVs and subsequent activation of the HGF/c-MET/PI3K/AKT signaling pathway . In addition, platelet-derived growth factor receptor-beta (PDGFR-β), which is enriched in EVs released by melanoma cells resistant to BRAF inhibitor, PLX4720, can be transferred to recipient melanoma cells, resulting in a dose-dependent activation of PI3K/AKT signaling and escape from BRAF inhibition . More recently, triple negative breast cancer cell lines resistant to Docetaxel and Doxorubicin were shown to release EVs that induced resistance to these chemotherapy drugs in recipient non-tumorigenic breast cells . Indeed, these EVs caused changes in gene expression associated with cell proliferation and apoptosis including the PI3K/AKT pathway, suggesting that they may contain ligands or receptors connected to the PI3K signaling axis . Likewise, EVs can also carry prosurvival molecules that modulate the immune system functions likely inducing immune tolerance and escape. Transforming growth factor-β (TGF-β) cytokines have been shown to play a critical role in establishing immunological suppression . Indeed, TGF-β1 was found in tumor-derived EVs and reported to inhibit the proliferation of healthy donor peripheral blood lymphocytes in response to IL-2 and to induce regulatory T cells . Additionally, in vivo and in vitro studies on HER2-overexpressing breast cancer have reported the presence of increased amounts of the immunosuppressive cytokine TGF-β1 in EVs released from cells resistant to HER2-targeting drugs . Although the patients’ cohort was too small to be conclusive, these findings suggest that the level of EVs-associated TGF-β1 in the plasma of the patients correlates with resistance to Lapatinib and Trastuzumab . Resistance to apoptosis is a vital escape mechanism by which tumor cells acquire drug resistance and thus contribute to cancer progression. EVs-mediated delivery of prosurvival factors is proposed to provide tumor cells with an additional mechanism to suppress cell death induced by anti-cancer drugs. Survivin is a prosurvival protein member of the inhibitors of apoptosis (IAP) family shown to be present in EVs derived from different tumor types [108, 109, 110]. Survivin has been implicated in the suppression of cell death and the regulation of mitosis, and therapeutic strategies targeting survivin in cancer are intensively investigated . Indeed, Khan and colleagues identified EVs as mediators of stress-induced survivin secretion from HeLa cells treated with a sublethal dose of proton irradiation . More recently, Kreger and colleagues have reported that treating highly aggressive MDA-MB-231 breast cancer cells with Paclitaxel (PTX) induces the secretion of EVs enriched with survivin that significantly promote the survival of serum-starved and PTX-treated fibroblasts and SKBR3 breast cancer cells .